Students at St Mary’s Primary School in Lancefield have started their new school year by welcoming a new pedestrian crossing to keep them safe on their way to school. The $70,000 Chauncey Street crossing was finished in time for term one, making sure children are safe from day one, while minimising disruptions during pick-ups and drop-offs. The project included a new crossing, kerb, channel, drainage, safety signage and fresh line marking near the intersection of Raglan Street. 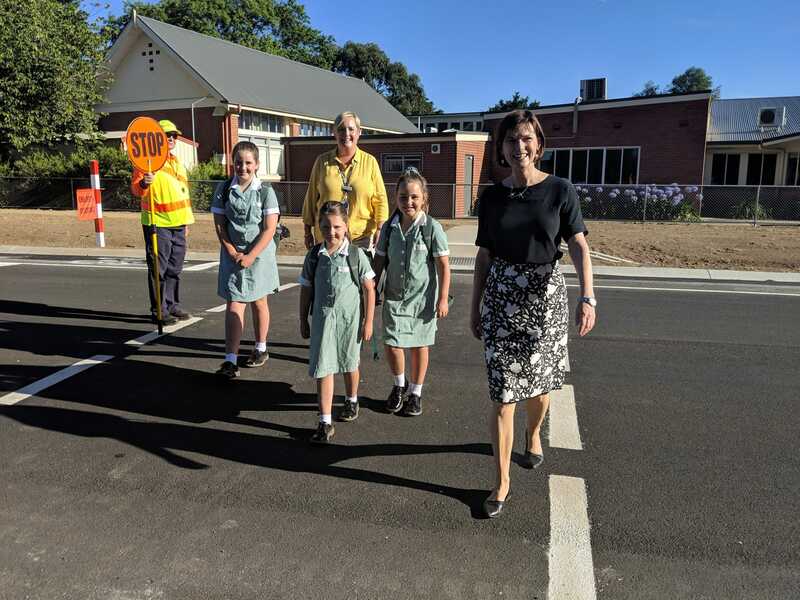 The Victorian Government worked closely with the community including St Mary’s Primary School, Macedon Ranges Shire Council and Regional Roads Victoria to ensure the crossing is in the best location for increased connectivity, visibility and safety. The crossing also opens up a job opportunity for a crossing supervisor to attend before and after school. St Mary’s Primary School principal Julie McDougall said the crossing has been a project of hers since joining the school in May 2017. “It’s amazing. It’s been a long time in the making and for our community to know they can safely cross a busy road is just peace of mind for parents and school community,” she said. Member for Macedon Mary-Anne Thomas said it was a great way to start the 2019 school year. “Congratulations to Julie and the whole school community for the way they campaigned,” she said. Regional Roads Victoria Acting Regional Director Northern Seamus Haugh said the crossings were an important part of the regional road network across the state. “This vital project is giving the 1,600 drivers travelling on Chauncey Street every single day some peace of mind by making pedestrians more visible during school pick up and drop off,” he said. Drivers across the region are being urged to help keep children safe as the back to school rush returns. On school days, speed limits drop to either 40km/h or 60km/h in the mornings between 8am and 9.30am and in the afternoons from 2.30-4pm, Monday to Friday. Drivers must obey reduced speed limits outside all schools on weekdays even if an individual school is closed.